Females build a small mud jug-shaped nest (pot) often on a twig. The shape of the nest is the source of the common name of this subfamily. They provision the pot with previously paralyzed beetle larvae, spiders, or small caterpillars, and often spring cankerworms (Paleacrita vernata). A single egg is suspended by a slender thread from the top of the side of the pot. A nest may have more than one cell. Offspring overwinter in the pot in the embryo stage. When the egg hatches the larva drops onto the food source and begins to feed. Adults emerge from the side of the pot in July of the following year. 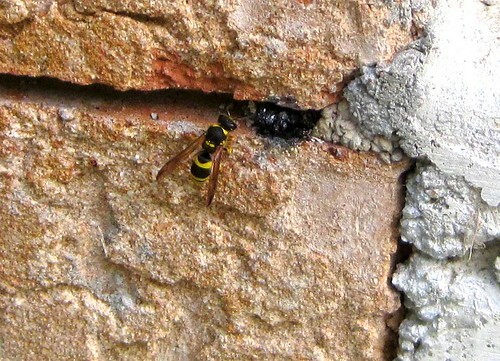 Wasp carrying an inch worm. Location: This was in our yard in Kilkenny, MN.